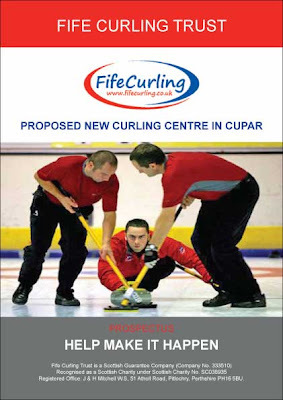 The Fife Curling Trust are progressing their plans for a curling facility in Cupar. Our previous post about the project is here. The news today is that a site has been secured in Duffus Park in partnership with Cupar Cricket Club. The cricket club will utilise the building in the summer months, thus giving the facility year round activity and revenue and fostering a sense of community round the facility. They will obviously use it for changing and clubhouse facilities and also use the ice hall for indoor practice during inclement weather. Both Elmwood College and Bell Baxter High School, which are close by, are keen to utilise the curling rink for their students! The prospectus is now available, see here. Now really is the time for curlers in the local area, and throughout Scotland, to get behind the project! I'm going to buy a brick, I hope you will too. The Trust Chairman, David Steel, says, "Now we have a definite timescale to work to and hopefully all going well, we will be operational for Sept 2010." Best wishes to all involved. Make the dream a reality! Scottish curling needs this to happen.